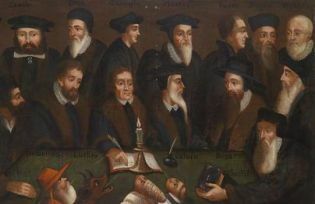 Reformation group portrait,17th century. Wikicommons/ Dorotheum. Some rights reserved. We keep hearing calls for an ‘Islamic Reformation’, but the Protestant Reformation was not a liberal enterprise: it was the original ‘fundamentalism’, whence the label now applied to Islam. We keep hearing calls for an ‘Islamic Reformation’, assumed to be the remedy for a fundamentalist Islam behind the conservative Salafi brand as well as the Jihadist. Islam, under these assumptions, generates problems because it had not been ‘reformed’. The assumed model is the Christian Reformation of the sixteenth century, the Protestant reformers, Luther, Calvin and their followers. Informed writers on religion and history have pointed out the problematic nature of these suppositions, with regard to the histories of both Christianity and Islam. Martin Luther’s Rycina Chrystusa i Antychrysta. Wikicommons .Some rights reserved. I argue here that Islam has undergone many reformations, in radically different directions: Wahhabism, much like Protestant reforms, urged a return to the scriptures and prophetic traditions and a rejection of ‘corrupt’ and heretical practices of saint worship and visitation of tombs, Sufi mysticism and ceremonies, and sectarian doctrines, principally Shi`ism. In contrast, a modernist and rationalist reformation was a powerful strand in public life, politics and culture from the nineteenth and throughout the twentieth centuries, in the Ottoman, Arab and Iranian worlds. These different kinds of ‘reform’ were institutionalised in various ways, recounted below. Liberal/ modernist reforms are now available in public space, but not attractive to most religious Muslims because they do not fit in with their social and psychological needs and outlooks. Liberal/ modernist reforms are… not attractive to most religious Muslims because they do not fit in with their social and psychological needs and outlooks. The Protestant Reformation was not a liberal enterprise: it was the original ‘fundamentalism’, which is the derivation of the label ‘fundamentalism’ for Islam. The Christianity that was being ‘reformed’ was that of the Catholic Church, one that was based on Church authority and hierarchy. Worship is conducted through rituals and ceremonies celebrated by its priesthood, and claiming the authority to dispense salvation. The Reformation was to challenge these assertions of authority and uphold, instead, the authority of ‘the Word’, the Bible, literally interpreted and preached. The Word rather than the Church Fathers was the source of all authority and the individual believer was to read the Bible and follow it according to her conscience. Salvation was by divine grace and not by authoritative dispensation via a priest. As such, it dispensed with elaborate ritual and ceremony, images and tunes, considered as heretical (note the parallels with Salafi Islam), in favour of an austere preaching and worship, based on the literalism of reading the scriptures in the vernacular languages. Hellfire was the sanction against sin, and salvation was by seeking divine grace, and not by priestly dispensation. When Protestants ruled, as in Calvin’s Geneva or in the Lutheran principalities, they instituted stern punishments for sin and heresy. Perceptive commentators, notably the late Ernest Gellner, had long noted the parallels between Protestantism and orthodox Islam. Gellner postulated a mirror-image reverse symmetry on the two sides of the Mediterranean: Christian Europe featured an established church with bells and candles, elaborate ritual and ceremony, opulent church hierarchy, and generally audio-visual aids to worship; as against the austere and literal scripturalism of the dissident Protestants. On the other side, it was orthodox Islam which was literalist, scriptural, austere, as against the audio-visual worship and ritual of heterodox and mystic Islam, in the form of sectarian and Sufi outfits. Most Islamic lands for much of their history and until recent times featured a diversity of Sufi orders, comprising large sections if not majorities of the population, high and low, with elite intellectual orders as well as popular Sufism for common people and soldiery. Crucially, Sufi orders constituted modes of social organisation, superimposed on craft and trade guilds, military units, urban quarters and rural/tribal regions. Crucially, Sufi orders constituted modes of social organisation, superimposed on craft and trade guilds, military units, urban quarters and rural/tribal regions. Gellner noted, in relation to North Africa, how Sufi saintly dynasties acted as intermediaries and conciliators cutting across tribal units. Some of the major Sufi orders disposed of considerable wealth in the form of waqf endowments, and their leaders enjoyed considerable power and connection to the ruling military elites, particularly in the Mamluke dynasties in Egypt and Syria, but also under Ottoman rule at various points. Being part of the power elite, Sufi ranks often included prominent ulama and judges, the guardians of orthodox Islam. This complicity excited periodic denunciation by occasional guardians of purity among the ulama, the most famous, or notorious, being Ibn Taymiyya (1263-1328). He confronted rival ulama, including prominent judges who doubled as Sufi leaders, denouncing mystic practices, including ceremonies of music and dancing, as heretical. Equally, he fulminated against popular mysticism and magic, notably the visitation of tombs as saint worship, for contradicting the oneness of God, as shirk, the association of other deities with the one God. Ibn Taymiyya’s fortunes fluctuated in his confrontation with the Sufis, depending on the disposition of the current Mamluke ruler. He ended his days imprisoned after losing out to opponents. Paradoxically, his funeral and tomb were sought after by the populace for blessing. Ibn Taymiyya’s doctrines and polemics constitute the most influential canon on the doctrinal and legal underpinnings of the current Saudi state and its clerics. Similar episodes of forthright clerics attacking sectarian and Sufi heterodoxies occur at regular intervals throughout Muslim history, their fortunes fluctuating with the balance of forces and possible patronage from the powerful. What is ‘reform’ in these contexts? What is ‘reform’ in these contexts? It is the assertion of literalist orthodoxy against what was seen as heresy and innovation: that is, fundamentalism, parallel to the Protestant fundamentalists, but in vastly different contexts. And it was not one decisive ‘reformation’, but repeated cycles. Salafist and Jihadist trends in modern Islam, including Saudi Wahhabism and its spread, are part of that trend: hardly the ‘moderate’ and liberal reformation that is being sought. The Wahhabi movement and its establishment were certainly claimed as a reformation, islah, and was recognised as such in some quarters. Muhammad Abduh (1849-1905) Egyptian Mufti and Islamic reformer. Wikicommons. Some rights reserved. But there was another kind of reformation, starting in the nineteenth century, part of Ottoman reforms, the Arab nahda, renaissance, and the Iranian Constitutional Revolution of 1906. The innovations in doctrine and law were part of political and cultural modernity, aimed at making Islam compatible with the modern transformations in society, culture and politics. In the Ottoman reforms, law, while nominally encompassing the Shari`a, was codified as civil law and etatised as state law. The most influential formulations of renovated doctrines came from intellectual reformers, most notably the pan-Islamic Jamaleddin al-Afghani (1838-1897) and his disciple Muhammad Abdu (d. 1905) who became Grand Mufti of Egypt. They were confronted by the imperial dominance of the European powers over the Islamic world, and like their secular nationalist counterparts, sought the remedy in the Islamic nations following the path that gave Europe its power: science and rationality, economic and military reforms and rational organisation of state and society. These steps were perfectly in harmony with Islam, they argued: not the corrupted Islam of recent history (as they saw it), but the pristine Islam of the Prophet and the first generation of Muslims. They read modern political concepts into Islamic origins: the Prophet commanded shura, consultation among the believers on the affairs of the community, and this was elemental democracy. The Caliph of the Muslims obtained his legitimacy from the bay`a, a pledge of allegiance from the members of the community, another element of conditional consent. Maslaha is the principle of public interest, according to which the sacred law was to be interpreted. The Prophet had also championed science and knowledge, which justified the adoption and development of scientific knowledge and rational technology. All these constituted the ideological architecture for a political modernity. The Prophet had also championed science and knowledge, which justified the adoption and development of scientific knowledge and rational technology. These elements constituted the components of national renaissance, of civilisation and true religion: progress against ‘backwardness’, takhaluf, and the corruption of religion and culture resulting from the accumulation of centuries of misrule. They had, in effect, internalised the European gaze on Muslim society, finding it despotic, corrupt, fatalistic and libidinal. In this respect, they shared with the Wahhabis and the secularists the antagonism to popular religion, Sufism, visitation of graves and saint worship, magic and ‘superstition’ (although the Wahhabis have their share of the latter: witchcraft is recognised as a criminal offence, much as the Protestants burned witches). Ataturk’s secularism, too, was aimed at popular religion: Sufi orders and practices were prohibited and criminalised, while ‘orthodox’ religion was put under state control. Muslim reformers and modern secularists agreed that popular religion was inimical to ‘progress’ and civilization: Salafists/Wahhabis denounced it as shirk, idolatry. What were the reformers reforming? The Christian Reformation aimed to reform institutions, the Church, or create alternative churches. But there was no church to reform in the case of Islam. The Wahhabist reform was to impose their doctrines and disciplines by the coercion of political authority, the Saudi state and its clerical entourage. There were parallels there with Protestant reformers, including Luther and Calvin, who invoked the coercive power of the ‘lay magistrate’ to enforce correct doctrine and conduct. This is hardly what the current call for an Islamic reformation has in mind. Sayyid Jamaleddin al-Afghānī (1838-1897). Wikicommons. Some rights reserved. For the modernist reformers, reforms did involve institutions at various points, primarily in law and education. Lawyers and reformist clerics were the architects of Ottoman legal reforms in the nineteenth century, the etatisation and codification of Shari`a law to conform with the modernising state, in the face of sullen resistance from conservative ulama and institutions. Similar waves of legal reform continued in Egypt and other parts of the Arab world in the twentieth century, sanctioned by reformist clerics, notably Muhammad Abdu, as Mufti of Egypt. At the same time, school and higher education were partly secularised, out of the control of religious institutions, except for religious education as such. Abdu’s main project was to reform the Azhar, the foremost Sunni university, with great reach and authority. He met much resistance and was not entirely successful. The Azhar was to be more radically reformed under the authoritarian rule of Nasir in the 1950s, when it became more securely subordinate to state authority, and a modern university with faculties of religious studies. Muhammad was a prophet and not a politician, he argued, and Muslims can choose what system of government and law would suit them. The greatest impact of the modernist reforms was in the discourses and contentions of the public sphere. The contentions were on multiple fronts, of journalism, political struggles, culture and education, and projects for social and legal reforms. Many of these issues were articulated, in turn, to the anti-colonial struggles, with the British occupation of Egypt and the dissolution of the Ottoman Empire and its Caliphate. The reformist thrust was to make Islam, doctrine and law pertinent to the modern state, education and culture, thus resisting the secular tinge of modernity. In relation to the anti-imperialist struggles, it presented reformed Islam as the path to a national renaissance, arming the Muslim nations with the powers of modernity, science and rational administration, including military might. As such, it was pitched against the outright secularist relegation of religion to the private sphere, and, equally, against the conservatives and fundamentalists arguing that the weakness of Muslim nations vis-à-vis Europe came from the departure from the true path and eternal verities of Islam and the example of the virtuous forefathers who ruled over the past glories of Islam. Al-Azhar University logo. Wikicommons/ خالد حسني. Some rights reserved. A notable episode in these contentions was around a book, Islam and the Principles of Governance (1925) by one of the foremost advocates of reform, Ali Abdul-Raziq (1888-1966). It was, in part, a response to the call for an Arab Caliphate, after Ataturk abolished the Ottoman Caliphate. He argued that the Caliphate or any form of religious government was not required by the canonical sources, and that the historical Caliphate was largely worldly rule by dynasties which asserted religious legitimacy. Muhammad was a prophet and not a politician, he argued, and Muslims can choose what system of government and law would suit them. Abdul-Raziq was a licensed ‘alim’, a graduate from Al-Azhar (and Oxford University) and a Qadi, a religious judge. His book raised a storm, with denunciation by the leading ulama (stimulated in part by the ambitions of the then King Fuad to be chosen as the Arab Caliph). He was stripped of his Azhar license and his judgeship, but received wide support from public figures, intellectuals and politicians, and went on to become a government minister. His arguments continue to be advanced by secular and liberal Muslims. The central problematic of religious authority in Shi`i Islam is that of the Imamate. The Absent Imam is the ultimate and infallible source of authority, so his absence poses a dilemma. The dominant doctrine in the late nineteenth century was the Usuli, which asserted the authority of the senior clerics, and the marja`s (sources of emulation), to represent the Imam as best they could, with hints by some of mystical contact. These claims were challenged by the rival faction of Akhbaris, who sought wisdom from the traditions and conduct of the Imams, with stronger hints of mystical communication. A more revolutionary challenge came from a messianic movement (1844-1852), that of Babism, with its leader claiming to be the Bab, the gate, to the Imam, anticipating his full revelation. He found much support in various quarters, including some clerics and their followers. The movement was ultimately suppressed, and the Bab executed. But it left a legacy of secret societies, and later gave rise to a new religion, that of Baha’ism. Paradoxically, the intellectual cadres of these secret societies combined their mysticism with an attraction to modern rational philosophies. The affinity may have been that of philosophical endeavour, and the rejection of what was seen as the obscurantist and reactionary doctrines of the ulama. These trends ultimately fed into the constitutional movement and the Constitutional Revolution of 1906. The forces that constituted the constitutional movement are generally characterised as threefold: modernist secular or heterodox intellectuals, clerics, and bazaar merchants, all opposed, in different ways, to the mounting dominance and interference of the European powers (Britain and Russia) in the country. The intellectuals had nationalist and modernist objectives: progress, legal reform, rational administration and national assertion. Bazaar merchants threatened by expansion and privilege of foreign finance and commerce, utilising the arbitrary powers of a bankrupt monarchy. The clerics were primarily concerned by European dominance and the ideas that came with it, threatening their controls over law, education and public life. Karbala shrine, 2011.Wikicommons/Aziz1005. Some rights reserved. It is not clear whether most of them understood the idea of the constitution, except that it would limit royal power through an elected body which they expected to dominate. Crucially, however, some leading ulama endorsed the constitution with arguments based on Shi`i jurisprudence: in the absence of the Imam, went the argument, the consensus of believers, guided by the clerics, constituted a source of authority, hence the constitution and elected bodies. In this argument the power of royalty was subordinated and conditional. These intellectual currents and disputes were shared across the border among the ulama of the Iraqi shrine cities of Najaf, Karbala and Kazem (suburb of Baghdad). Some Shi`a intellectuals in Iraq, including clerics, had also participated in the reformist ideas and debates in the Arab world. The Iranian constitution and the institutions it inaugurated were flimsy and subject to the political and military storms that engulfed the country in the twentieth century. It was mostly a dead letter, relegated to despotic powers. Even the Islamic Republic, under Khomeini and his successors, installed a constitution, which was not itself the Shari`a, but enshrined the Shari`a as the source of legislation. Yet the constitutional idea, or constitutional memory, remained a potent ideological force resurrected at every stormy junction of that history. Even the Islamic Republic, under Khomeini and his successors, installed a constitution, which was not itself the Shari`a, but enshrined the Shari`a as the source of legislation. In effect, the constitution of the Islamic Republic comprises an uneasy combination of clerical power and popular sovereignty: the primacy of the Leader (the ruling Faqih, Khomeini and then Khamenei), but alongside elected institutions of parliament and president. We see, then, that Islam does not lack a reformation, but has had many reformations, both Sunni and Shi`i, but with diverse effects. The Wahhabi/Salafi reformations are fundamentalist and authoritarian, enjoining obedience to the Muslim ruler, charged with enforcing ritual and moral disciplines. In these respects, they have certain affinities with the Protestant Reformation and some of the regimes it installed, including Lutheran principalities in Germany and Switzerland and the Puritans of England and Scotland. However, these trends were submerged in a different historical trajectory in Europe. Ruhollah Khomeini and people. Wikicommons/نامعلوم l. Some rights reserved. The modernist reforms of the nineteenth and twentieth centuries were consonant with the nation-state and its institutions. They advanced theological and historical reasons for the compatibility of original Islam with science, rationality and constitutional rule. These ideological formulations are still features of public discourse, advanced by various parties and forces, both secularist advocacy of the separation of religion and politics, and Islamic parties arguing the compatibility of Islam with democracy, such as the later incarnations of the Muslim Brotherhood and the Turkish AKP (at least in theory!). Faced with the political challenges of Jihadism on the one side and ‘Islamophobia’ on the other, politicians and pundits have made proclamations about Islam: pace violent Jihadism, we hear assertions that Islam is ‘a religion of peace’. Or conversely, we hear rightist proclamations that Islam is inherently aggressive and expansionist. And we hear diverse characterisations of the essence of the religion from its own adherents. As students, historians and analysts of the religion and its social and political contexts we cannot subscribe to any of these essentialisms. As students, historians and analysts of the religion and its social and political contexts we cannot subscribe to any of these essentialisms. Islam comprises many components, historical and ideological layers. The modern believer and practitioner of the religion can draw on diverse elements of the Muslim corpus: the scriptures, Quran, and the prophetic traditions, Sunna and Hadith, both containing diverse and contradictory messages, much like the Bible; the many strands and schools of fiqh jurisprudence; equally diverse strands of Sufi mysticism; the historical examples and legends (so basic to the constructions of Jihadism); and the corpus of modern reformers constructing religious compatibility with models of modern society and government. Liberal, reformist Islam enjoyed wide public favour in the earlier twentieth century, till the 1970s, with the prevalent nationalist and developmentalist projects and ideologies often articulated to leftist ideas. The collapse of the credibility in these projects and of leftist ideologies gave rise in many parts of the world to identity politics, in which ethnic and religious affiliations are central. Identity politics demands an emphasis on difference from the Western other. Adherence to religion among Muslims in their majority countries and in Western diasporas is commonly based on affiliations and sentiments that do not favour liberal reformism. In much of the Muslim world, the precarious conditions of security and livelihood for many drive people to seek protection in communal networks of kin, tribe and patronage, in which religious authority plays an important role. Patriarchy and communal authoritarianism are buttressed by religious rules and disciplines. Mosques, madrasas and charities, many financed by Saudi donations and personnel reinforce these communalist formations. While many Salafis are not violent militants, these ideas and institutions do mutate into Jihadism: the Taliban were initially the product of Saudi financed madrasas in Pakistan. Muslims in the West comprise many social, ethnic and class groupings, with religion playing varying roles in their lives. The vocabulary of liberal reformism appeals to many educated middle class and professional Muslims, alongside outright secularism. Conservative and fundamentalist religion includes different constituencies. Patriarchal and communalist elements are keen to maintain social and moral controls, and are worried about the contaminations of Western personal liberties for their women and children, and seek remedies in assertion of religious disciplines. Identity politics, what may be called ‘Umma nationalism’, the idea of a universal Islamic community confronting Western/Christian and Jewish challenge or hostility, also feeds into more fundamentalist orientation. These sentiments are fed and feed into rising racism and anti-Muslim ideas and movements in the West. The attraction of Jihadism for some of the young Muslims are part of this trend. Islam, then, has had many ‘reformations’, including liberal and rationalist reforms. Only, under the conditions outlined above, these ideas have little appeal to many Muslim constituencies at the present time. Those inclined to liberal ideas are more likely to be secular or nominal Muslims. His earlier books include Islam, the People and the State: Political Ideas and Movements in the Middle East (IB Tauris, 1993); A Taste of Thyme: Culinary Cultures of the Middle East (IB Tauris, 2001); and Law and Power in the Islamic World (IB Tauris, 2005).